Interested in the zero or low-waste lifestyle? Need some fresh inspiration to jumpstart your journey? In episode 58 of the Cohesive Home Podcast, Melissa chats with Lindsey McCoy, co-founder of Plaine Products, a sustainable, vegan, and non-toxic hair and body line. Lindsey shares her drive to start the company and practical ideas for living sustainably. Try Plaine Products and get 20% off your order with code “cohesivehome”. Head to plaineproducts.com to shop! Interested in a more peaceful way of parenting and a simpler home experience for your children? 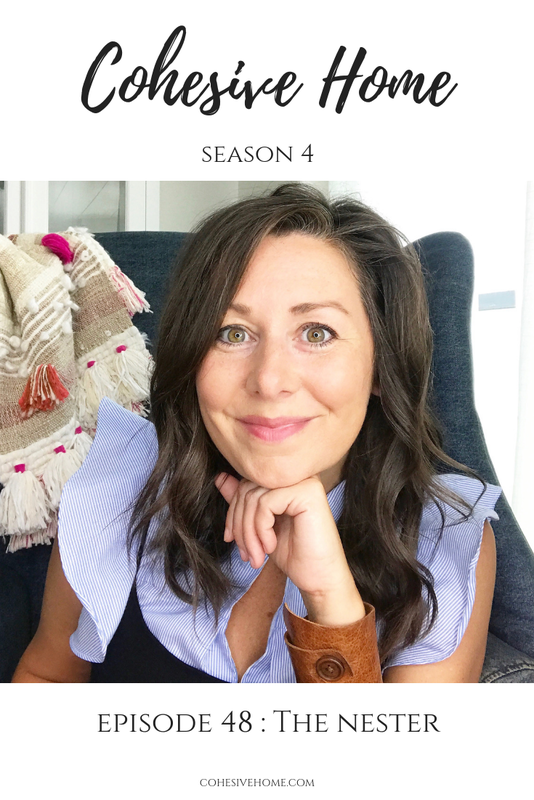 In episode 57 of the Cohesive Home Podcast, Kate interviews Simone Davies, the Montessori teacher and blogger behind the popular website The Montessori Notebook, which helps families bring the Montessori Method into their daily life. She's also about to release her new book The Montessori Toddler, a positive parenting guide to raising little people. If you're scratching your head and asking, what's Montessori? You will learn so much from this episode. Even if you're familiar with the method, Simone shares so much wisdom and practical advice for implementing it in your home. In episode 56 of the Cohesive Home Podcast, Kate and Melissa tackle a listener question about living intentionally. A listener said “How do you all figure out how to live intentionally every day instead of reactively? I know what my values are, but I’m not sure how to be purposeful on a daily basis and actually living them. Thank you for listening to episode 56! If you enjoyed this episode, please leave us a review on iTunes or share it with a friend. Thank you so much to our sponsor, Care/of! Take advantage of this month’s special New Year offer! For 50% off your first month of personalized Care/of vitamins, go to TakeCareOf.com and enter "cohesivehome50". Planners, goal setting, and habit shifts with Whitney English in episode 55 of the Cohesive Home Podcast. Whitney English, founder of Day Designer, a business strategist and creator of H.E.A.R.T. Goals, shares her story and wisdom with Kate. Ever wish you could sit down with a financial expert and get practical advice? Well, we here you! In Episode 53 of the Cohesive Home Podcast, we invited Jessi Fearon, financial expert from Real Life on a Budget, to share her advice for being intentional with finances in 2019. Read on for more. A big thanks to Warby Parker for sponsoring the Cohesive Home Podcast. Get your stylish and affordable glasses for only $95 delivered straight to your door by heading to warbyparker.com/cohesivehome. How do you goal set for the New Year? In Episode 52 of the Cohesive Home Podcast, Kate and Melissa give you full access to their goal setting process by talking through 2019 LIVE. The two share their personal, family, and business goals as well as what worked and didn’t work in 2018. This episode is like sitting down with your girlfriends for a fun 2019 planning session; grab your paper and write down your goals too! Kate and Melissa’s business goals and how they hope to grow their side hustle. What will Cohesive Home be upto in 2019? Listen to find out and subscribe to our newsletter to catch our survey going out at the end of the month. We need your help! Already feeling stressed by the holidays? Need permission to simplify and celebrate in the way that is best for YOUR family? In this episode, Kate and Melissa share the ways they've uncomplicated their holiday celebrations and how to find traditions that feel right for yours. They also share about how to deal with family that doesn't agree with the way you celebrate and how to keep your values in mind when creating new traditions. For new episodes and resources, head to cohesivehome.com for more! For Episode 50 of the Cohesive Home Podcast, we're welcoming Jennifer Pepito: homeschooling mom of 7 and owner of Peaceful Press, a homeschooling curriculum and resource shop to the show. Melissa and Jennifer chat about seasons of life and knowing when it's time to make a change, along with the steps they took to make those changes with a large family. Why she chooses essentialism over minimalism and living intentionally as a family while still creating memories together during the holidays. Even if you're not a homeschooling family, we think you'll be inspired by this conversation and walk away with a few ideas to shape your cohesive home! Stay tuned till the end when she shares a discount code for one of her amazing products. What's your favorite way to live simply? Zero wasters--head to Episode 21 to hear our experiences with zero waste living. Interested in trying a zero-waste shampoo/conditioner/body wash option that Melissa LOVES? Check out Plaine Products and use code: PLAINELOVE for 10% off! Clearing out the family schedule-- head to Episode 06 for more! Decluttering--you know Kate and Melissa have so much to share on this topic! Get your fill by listening to: Episode 31: Change and Decluttering, Episode 34: Minimalism 5 Years Later, Episode 12: Newbie Decluttering Tips, and Episode 2: Generational Clutter. The Nester is in the (Cohesive) House! Join Kate and Melissa for a chat with Myquillin Smith, better known as the Nester, about how you can create your own Cozy Minimalist Home. You are going to love all of the tips and suggestions she offers. Thanks so much for listening to Episode 48 of the Cohesive Home Podcast. We would love for you to subscribe and leave us a review on iTunes! Have you ever faced a really difficult decision about your kids? In episode 47 of the Cohesive Home Podcast, Melissa and Kate are bringing it with vulnerability and honesty, sharing how they handle difficult situations and decisions. Melissa opens up about her decision to stop homeschooling her kids and what's next for them. Kate shares how the launch of her podcast got pushed back by a death in her family and how she's dealing with both. This episode will help you feel encouraged and less alone in your struggles! Melissa shares why they stopped homeschooling and how she's processing that decision. Kate talks about her struggles recently and why routine matters. They both chat about ways to overcome struggles and make difficult, but needed decisions. Thanks for listening to Episode 47! Please subscribe at cohesivehome.com and leave us a review on iTunes! Homeschooling, planners, and fall routines for the win! Kate and Melissa are back fun and informative episode about how they are working the homeschooling in a small space life. Melissa shares about their transition to apartment living and Kate gives the lowdown on homeschooling in her home on wheels. The two also share their planner systems and how they organize their days. Read on for more. -- Melissa shares their homeschooling curriculum and the places they homeschool during the day. -- Kate real talks life in 200 sq. ft with three little kids and how she homeschools her 7 year old with a toddler underfoot. -- How to REALLY homeschool simply if you’re short on space and time. -- Free spirit Melissa’s super traditional way of tracking her days. -- Kate’s rebellious planner side and the one system she just can’t quit. For episodes, updates, and more, please subscribe on our website cohesivehome.com and receive our FREE guide “7 Steps to Your Cohesive Home.” Thanks for listening! Has homemaking gotten a bad rap? In Episode 45 of the Cohesive Home Podcast, Melissa and Kate tackle the meaning of the word "homemaker" and update it for today's home creators. They share their own personal experiences with homemaking and their top tips for creating a home of your own, whether you live in a physical home, an apartment, or even a home on wheel; it all counts! *What's coming up this fall for Cohesive Home; a new series on intentional home design for raising families! *Melissa is going back to school for aromatherapy! Contact her with questions or to simply talk oils. *Kate shares her new podcast and upcoming re-launch of The Streamlined Life offering coaching and resources to help mamas to thrive in motherhood; stay tuned for more! Thank you for listening to episode 45 of the Cohesive Home Podcast. Subscribe on our website for updates, announcements, and more! This episode was recorded from Melissa's Oklahoma bungalow and Kate's nomadic home on wheels so please excuse the ambient background rain. Melissa and Kate are back from their epic break and jumping back into the podcasting saddle with Episode 44 of the Cohesive Home Podcast. In this episode the two share what life was really like behind the scenes and why a break from the podcast was a necessity. They dig into the value of rest and share the major life lessons learned from taking a step back. If you've ever wondered if your life has become too hectic, this episode will give you the courage to put yourself and your family first! No matter their age, all kids crave a space to call their own, whether it's a bunk in a shared room with siblings or their own bedroom. In EP 43, Kate and Melissa share their thoughts on creating kids spaces: from decluttering to design and function. If you have little people in your life, you'll enjoy this laidback chat about giving them a space of their own. This episode is sponsored by one of our favorite go-to snacks for our kids: KIND bars. You can get your very own box of 10 bars for FREE, just pay shipping, and see why we love them so much. Head to kindsnacks.com/cohesivehome for all the details.